This listing is not physically shipped to your residence, but is sent to the email address listed on invoice as an 11 x 14 high resolution jpeg. I snapped this picture while working in my rose garden at my home in Adams County, Pennsylvania. 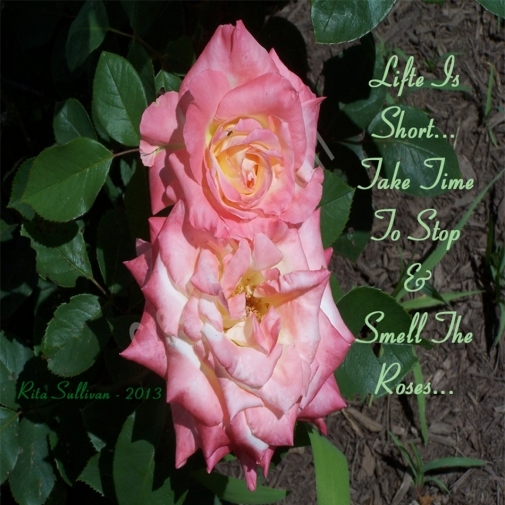 © 2013 Pink Roses-Life Is Short, Rita Sullivan. For personal, non commercial use only. Not to be resold in any medium. Intended purpose is for: personal, non commercial use only. NOTE: Not for commercial use. CreativeXpression1 watermark will not appear on jpeg file; however, the signature watermark will remain on photo. Notice of Copyright: Customer is not buying the copyrights to this digital file when purchasing it. Customer is not being given permission with purchase to resell (in any form, including other online marketplaces), copy, edit, or give away CreativeXpression1 digital files. Please NO SHARING. This image can be printed in any format for personal noncommercial use only. By purchasing and downloading these items, customer agrees to abide by the terms of this copyright.